Cantaloupe Bowl - A recipe from Savor California, the online showcase for extraordinary gourmet foods and beverages from California. Slice the cantaloupe in half. Lengthwise is best if it's oblong in shape, because it creates a wider bowl. Scoop out the seeds and place each cantaloupe half in a bowl plate. 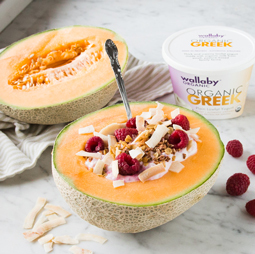 Mash half of the raspberries with the Greek yogurt, and spoon the mixture into the hollowed out cantaloupe halves. Top each cantaloupe half with the remaining raspberries and drizzle with maple syrup or honey to taste. Sprinkle the granola over the top and serve immediately.